My mom adores alliteration so the title of this book tickles her fancy no end. Hair Calamities and Hot Cash is a novella by Gail Pallotta and is full of adventure, comedy, and suspense. Poor Eve Castleberry runs a North Caroline beauty shop. For some reason, this widow is finding her hair products are not doing what they are supposed to do with strange results. To top it off a New York stockbroker crashes his car into her salon and he’s on the hunt for criminals wanted by the FBI who stole his client’s cash. Merry mayhem ensues and this is one delightful romantic comedy as the two work together to get the money and solve the riddle of what’s going wrong at her store. Writing witty comedy is an art and Gail Pallotta has it mastered in this novella. No cats or dogs but any book that makes my mom giggle is worthy of five bones! There must be some odd coincidence that the Black Diamond Gothic Regency series by my mom, would release on Black Friday with a special bonus! Now, as a dog can I just say I find it clever that the author, who happens to be my mom, put an animal in each of these books as a supporting role? In the first three there features a parrot, a dog, and a talking crow! I won’t tell you which appears where, you’ll have to read them to find out. First of all let’s just remember that The Baron’s Blunder which released last year, re-releases today for FREE and with a new cover and fresh revisions. How cool is that? The story is a prequel to the series and introduces us to the evil Black Diamond who becomes a nemesis to Lord Marcus Remington’s friends and family. The Honorable Henrietta Allendale, sister to Lord Remington, is unbeknownst to her brother acting as a spy for the War Office at Whitehall. When she runs into Lord Charles Percy she suspects something is off with the man who introduces himself originally as “Mr.” Percy instead. And she didn’t need him to save them from a highwayman. She was perfectly capable of dispatching the criminal herself. As the couple verbally spar she shows her abilities and uncovers his lie. Can she trust a man who would deceive her so, even though it was to avoid a title-seeking debutant of which she was most definitely not. But something about the handsome lord intrigues her. Lord Percy was adverse to marriage until he met Miss Allendale. But courtship must take a back seat to keeping her alive from the minions of the Black Diamond who now have her as their target simply because she was seen with him. Can he save her and win her heart at the same time? Or will they all lose the greatest treasure of all, love? The first full-length novel in The Black Diamond Gothic Regency series is The Virtuous Viscount. Lord Marcus Remington has decided it is time to find a wife. He didn’t expect her to be in the wreckage of a carriage in the middle of a spring storm, but rescuing Miss Josephine Storm challenges his heart and very character of the man known as the Virtuous Viscount. But when the injured young woman weighs heavy on the viscount’s mind, convention goes out the window. As Miss Josephine Storm recovers her physical health, her heart is in even more danger. When The Black Diamond’s plot to take over Britain puts Marcus and his friends in the criminal’s cross-hairs, Josie’s life is threatened. Marcus must chance losing her good favor and risk his virtuous reputation in order to save her life. Can Josie believe in the man she thought she knew when the facts say otherwise? The second full-length novel in The Black Diamond Gothic Regency series also releases today! Lord Phillip’s Folly features the first of Lord Remington’s friends to find himself faced with the challenges of love and courtship. No good deed goes unpunished.Lord Phillip Westcombe is a younger son and sufficiently independent. He has no need upset his tidy life with the messiness of love, but when he comes to the rescue of the lovely Lady Elizabeth Follett, and the two are found in a compromising position, his life takes an unexpected turn. Barely knowing each other, they are forced to wed.
Embarking on a new life they must learn to trust God as they face an evil which threatens their lives and the security of the British Empire. Will the minions of the Black Diamond–the bounder who owns the soul of Elizabeth’s father–succeed in their evil plans? Will Phillip and Elizabeth’s new love and faith survive the test that awaits them? Or will they all fall to the Black Diamond? I strongly recommend all three of these books and there are three more to come in 2018! Sir Michael’s Mayhem, Lord Harrow’s Heart, and The Captain’s Conquest. And all feature an animal as part of the supporting cast including a ferret, a kitten, and a sheep? Yes! All these books get five bones because I’m biased and these books are by my mom! Danele is a sweet spirit with a personal story as compelling as the fiction she writes. I hope you enjoy getting to know and enjoy her as much as I have since we first met face to face in May of 2014 in the Rocky Mountains. I’ve wanted to be a writer since I was five, but illness seemed to cut those dreams short. A faulty furnace in my home had a low-level carbon monoxide leak that almost killed me. This poisoning triggered severe Multiple Chemical Sensitivity. My illness continued to worsen, and eventually, I was quarantined in my home for seven years. As I began to regain my health, I used writing as a way to escape my physical pain and loneliness. When the pain was especially bad, I would lie in bed, look up at the ceiling, and think up plot twists and funny scenes. The Time Counselor Chronicles was my secret land. It was my escape hatch. It was the place where my pain, heartache, and loneliness couldn’t invade. By the time quarantine was over, I had written the first six book in my series. Time Tsunami, my first book, was published just a few weeks ago. When I was writing my books, I harbored a breathless dream that they would someday be published, but publication wasn’t why I was writing. I was writing to entertain myself and give myself hope. Besides pens that leak all over my manuscript or running out of Post-It-Notes? I suppose it would be lack of time. The days stream by so quickly. It feels like I just get up and then it’s time to go to bed again. I don’t know how the hours fly by so fast! I get whiplash just by looking at the clock! I also HATE hyphens. I drive myself NUTS over hyphens. Honestly, they are the bane of my existence. It doesn’t matter how much I study the rules surrounding them—I still get confused. Most people get confused over commas—but me?? Ugg!! It’s those nasty little hyphens. I actually had a nightmare about them once—the hyphens in my manuscript turned into squirmy, hissing snakes and crawled over and tried to strangle me. Oh, Susan! You ACTUALLY want me to admit it?? It’s funny now, but it was horrible at the time. When I was getting ready for the Christian Writer’s Conference in Estes Park, Colorado, one of the things I had to do was prepare a synopsis of Time Tsunami. I worked for months on that synopsis. I perfected EVERY detail. I scrutinized every comma—the placement of every sentence. But when I went to the conference and began handing my synopsis out to editors, I realized that I had misspelled tsunami. Oh!—The!—Agony! It reminded me of my high school graduation party when I “Mr. Cleaned” the counters twenty times and totally forgot to dust the end tables by the couch. Somehow, the word “tsunami” was wrong in my computer’s dictionary, and I never caught the mistake. Luckily, no one at the conference did either—or else they were too nice to mention it. Hands down, my illness. There were years when I literally couldn’t write a word. I’d try so hard to write, but it was as if the creative part of my brain was frozen. It was like trying to run on crippled feet or trying to see with blind eyes. When my partial amnesia cleared up, so did my problems with writing. I was so glad when I could write stories again. There is such a creative rush that occurs during the writing process. I really missed it when I was ill. Being a writer can be very scary. You’re taking a secret part of yourself, putting it on display, and holding it up for criticism. You’ve spent countless hours agonizing over your book, trying to make it just right. You hope that everyone will love it, but that’s not realistic. We live in a world where some people don’t like chocolate or ice cream. And if that’s the case, there’s no way everyone is going to like what you write. Rejection hurts, but I try to put it in perspective. And the first step is to categorize why the negative review is coming my way. Is it constructive and meant to make me better? Is it a matter of taste—like broccoli vs. green beans? Or is it mean? If it’s constructive, I listen and try to learn. If it’s a matter of taste, I try to shrug it off. If it’s mean-spirited, I pray for that person and realize that everyone has bad days. When it comes to rejection, I think the most important thing is to be confident in who you are and what you are writing. If you love your book, it doesn’t really matter what anyone says–but OUCH it hurts sometimes! The proudest moment of my life was when my father told me he loved my book. Don’t force publication. Wait on God’s timing. Make sure you’re where God wants you to be. Seek His face. God has a perfect plan in motion—wait for it to unfold. And when God tells you to move—do it! Try to make a schedule and write something—even if it’s only a sentence—every day. Use the moments right before you go to sleep, and right after you wake up, to think about your story. I plan most of my dialogue and plot twists that way—not at the computer. Enjoy writing. Make it fun. Write for YOUR pleasure. Get a KICK out of it! If your book is entertaining to you—it probably will be for your readers too. Giggle at your funny scenes. Cry at your sad ones. Be breathless. Be energized. Don’t stand aloof from your characters—live the story with them. Let your book come alive. Immerse yourself in it, and HAVE A BLAST! I wrote my novels as a way to distract myself from physical pain and the loneliness of quarantine. I want my books to be an enjoyable escape for my readers. I want them to get lost in the world I created. But more than that, I want my readers to see God’s love. During quarantine, I came to a deeper understanding of God and my relationship with Him. I’m hoping that some of what I learned is transmitted through the pages of my novels. I hope that people will really enjoy my book. I hope it brings them happiness. Thank you so much for interviewing me, Susan! I really appreciate the opportunity to talk with you and your readers. 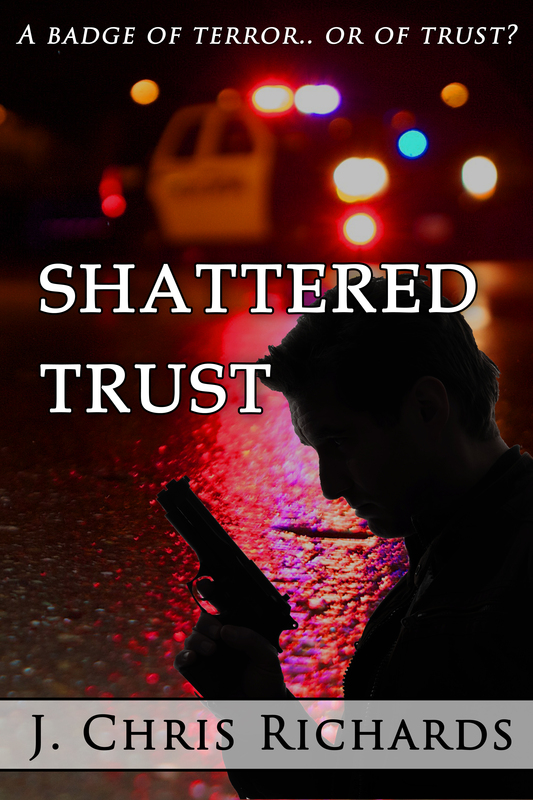 J. Chris Richard’s debut novel, Shattered Trust is everything a suspense novel should be. Written for the inspirational market the journey to redemption by a police officer could not be more timely given the current events in our nation. Officer Logan Taul realizes that he’s become a monster. Not a police officer out to protect the public but more to assert his authority. Confronting the evil within him is painful enough without the need to confront it from without and his transformation comes with a cost. Logan embraces this journey in spite of the pain and sacrifice to become the kind of police officer he intended to be when he started on the force. But his journey also reveals other areas in his life desperately needing reform. A group of rag-tag teenagers adopt him and begin to show him what life and friendship are really all about. Although he’s tutoring some of them, he’s the one learning the real-life lessons he’d lost along the way. And when physical attacks come, and his reputation is torn to shreds, it is the faith of these young people who keep him moving forward to redemption. He also confronts his real identity as a dead-beat father and strives to reconcile with his estranged ex-wife and children. This too is not easily done. In our country, police are often maligned and while this story shows a corrupt officer, it is one of redemption, growth and earning the right to wear the badge. Officer Logan Taul shows how difficult and dangerous that struggle can be and his change and its ripple effect impact the lives of many around him. This story grabs you and doesn’t let go. We all have monsters as part of ourselves and while this is a novel filled with suspense it is also one of hope and a story of healing and growth that is heartwarming. Kudos to J. Chris Richards for her rich characters and storytelling. Blue lives matter and she honors that beautifully.